An overview of Smart City waste management market. View wireless solution providers, case studies and data platform offerings. Better understand the currently available smart waste management tracking systems and how they work. Filter and compare solution providers. Get an overview of currently deployed case studies and their implementation results. Clean CUBE, the solar-powered waste compacting bin. 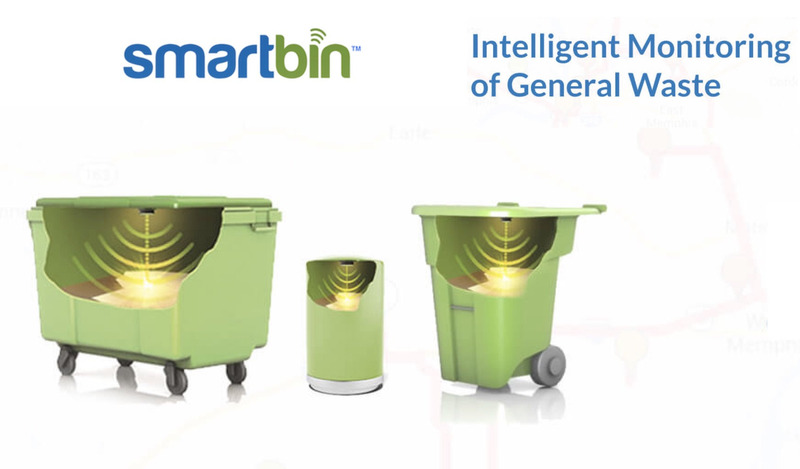 Holds up to 8 times more waste than standard bins and communicates the information it collects wirelessly to Clean City Networks waste management platform. Clean CAP, the wireless ultrasonic fill-level sensor for waste bins. Can be attached to any type of bin, container or tank to sense both solid and liquid waste. Wireless real-time communication with Clean City Networks. Clean City Networks, the real-time monitoring and data analytics platform. Monitors container's fill-level and status in real time, generates data analytics reports, and optimizes collection routes using predictive algorithms. "With the tagline "instant cash for phones" the ecoATM kiosk's use the Axeda cloud platform and built in diagnostic tools to analyze the condition and quality of old consumer devices (currently targeting cellphones) and give users cash on the spot for their used electronics saving them from years of sitting in the junk drawer of your house and out of landfills creating toxic eWaste." "Elaborated by the SENSEable City Lab and inspired by the NYC Green Initiative, TrashTrack focuses on how pervasive technologies can expose the challenges of waste management and sustainability. Can these same pervasive technologies make 100% recycling a reality? TrashTrack uses hundreds of small, smart, location aware tags: a first step towards the deployment of smart-dust - networks of tiny locatable and addressable microeletromechanical systems.These tags are attached to different types of trash so that these items can be followed through the city’s waste management system, revealing the final journey of our everyday objects in a series of real time visualizations." "The Forage Tracking project is mapping the tacit knowledge and spatial organization of informal recyclers. We are using location-detecting hardware and software to investigate how Catadores, informal recyclers in Brazilian cities, find and collect material in the city. We are also developing participatory platforms that will help them to organize their activities and connect the cooperative to the citizens."